Different views on the conventions. Unity in the Democrat party was on shaky ground before Wikileaks Once the e-mails were disclosed, more corruption was shown for a larger part of the Democrat party. Debbie Wasserman Shultz was demoted as chair of the DNC, but got a job with the Clinton campaign almost immediately. No big deal. Melonka’s speech was close to the speech that Michel gave in 2008. How many people who gave won or about to win, have thanked people for teaching about hard work and other values? There have been a few other Democrats that have been caught in plagiarism… Melonka did not say that say was not great before Donald Trump. The Republicans stressed America first. They pushed security both home and abroad. The elements of patriotism were there from day one. They started mentioning the problems the U.S. faced from day one. 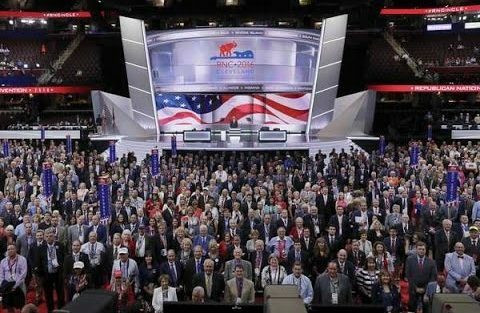 The Democrats did not display any American flags until day two. ISIS was hardly mentioned. Most of the Trump family was unknown before the election, so some emphasis to them and the Trump empire was to be expected. With the current events and recent past history, people in law enforcement and the military were needed to show the issues of safety and security. Family members of those who were killed in Benghazi dealt with actions or lack of action by Hillary Clinton. The story of the video causing the problem was just one of many lies. Once the Democrats got past the politicians, the speakers were in your face. Putting an illegal alien on the platform, showed disregard for the law/ It is true that she assimilated and has not caused any problem. She was victim of her parents. Now Mr. Khan a Muslim father who lost a son in service to our county, had the view of a grieving parent, like those parents of those who were killed in Benghazi. Every time someone makes a bad generalization there are problems, Mr. Khan’s son was honorable, but what about the Fort Hood killings and Chattanooga. This is 2016 not 2004. One gets two different view by framing the situation as anti- Muslim or anti-terror or jihadist. How close do the Khan’s follow Sharia law, or which interpretation? Trump uses the terms temporary and vetted. The mothers of those killed by cops also had a grieving view. My view is that all lives matter. A poor judicial system is not confined to minority areas. Poor law enforcement occurs where minorities are not prevalent. The case in New York City, shows me where the police were wrong. Defining the less than five percent of poor law enforcement is hard to do. If black lives matter why do we have so much black on black crime? Donald Trump went over a plan point by point, on how he would make America Great AGAIN. It was factual and honest. For some the pasts was brighter, and the darkness some saw could be the future under Hillary. To avoid the issues, Hillary went to the old patriotic speech that didn’t reflect what Obama has done. To create jobs we need to cut many regulations, which includes using all forms of energy available including coal. We need to stop the terrorist threat both home and abroad. We need to return to a justice system where no one is above the law. People who have the power to classify documents should know when to classify. If you are the originator it won’t be marked classified if you don’t do it. The trade agreements hurt the American worker by themselves, but the regulation do almost as much damage, How many people have dropped out of the work force? I have been around long enough to believe the old cliché, figures don’t lie but liars can figure, but also added the phrase that some people just don’t know what figures to use. The problems created by the Wikileaks, could be the same as Hillary’s private server, just not disclosed yet. Trump asking if the Russians had the missing e-mails was satire on what has been printed, not asking for new hacking. Apathy is Fatal to FreedomIs the NRA Like ISIS?